NBC’s Brian Williams is trending on Twitter. He wishes he wasn’t. Williams apologized Wednesday for retelling a story that simply wasn’t true: he wasn’t on a chopper that was fired upon in the early days of the war in Iraq. He was called out for his version of the story — retold on the “Late Show” in 2013, and again just last Friday on “Nightly News” — by some of the soldiers who were fired upon. Williams’ apology has been reported this morning on HLN, CNNI, FBN, several times on CNN U.S. and on Fox News almost hourly. Internationally, it’s been reported on the BBC and ABC News in Sydney. MSNBC has not mentioned it. (Update: Jose Diaz Balart reported the story on MSNBC at 10:49am.) As happens in these situations, there’s a meme: #BrianWilliamsMisremembers. 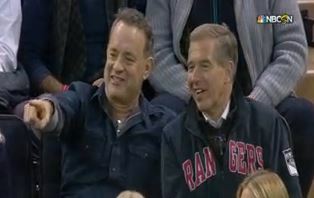 While Twitter began to fill up with other Brian Williams misremembrances, the NBC News anchor was enjoying a New York Rangers game with Tom Hanks, who did not really save Private Ryan.